Bali Activity Special Price offer by Hiro-Chan group! In this tour, you can try cycling and rafting in same day! In cycling, the guide will take you 25km down hill course around Kuntamani until Teragawaja. 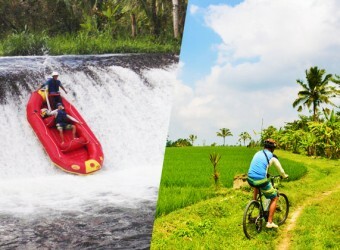 After cycling you can try at Teragawaja rafting which most strong current river in Bali. It has 4m big drop in the course! * Pick-up or drop-off to airport is not available. * Transport is offered by sponsor activity company. You might share a transport car with other guests. * Transport car pick-up guests in other hotels, so pick-up time might be changed. 12：45　Arrive at finishing point as Gunung Kawi. Move to restaurant. 15：00　Arrive at rafting company, prepare. (*1) During lunch at tegalaren rice terrace, In case if you take photo of local people who working on rice terrace, they might ask you some fee, please notice that. * This schedule is sample. the time and schedule might change.